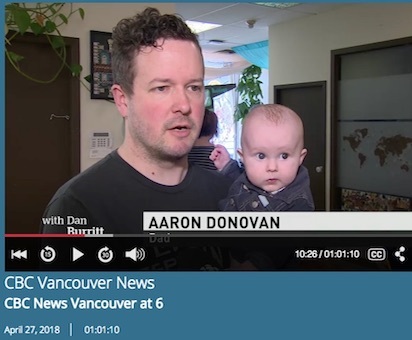 Despite their different schedules and reasons for valuing flexibility, when asked, all the parents who attended last month’s Lunch & Learn with MLA George Heyman, at Buddings Daycare (as reported by CBC’s Zahra Premji) described how the centre’s one-hour’s-notice licensed educational program had helped their families. The CBC was also there when the centre at Oak and Broadway first opened in 2011. At that time, Deborah Goble interviewed parents who were frustrated by the lack of such a program, and hopeful about the Buddings promise. Eight years later, on June 1, 2018, the promise has been kept, and the opening of a second location for the popular daycare business begs the question: Is this daycare a daydream? 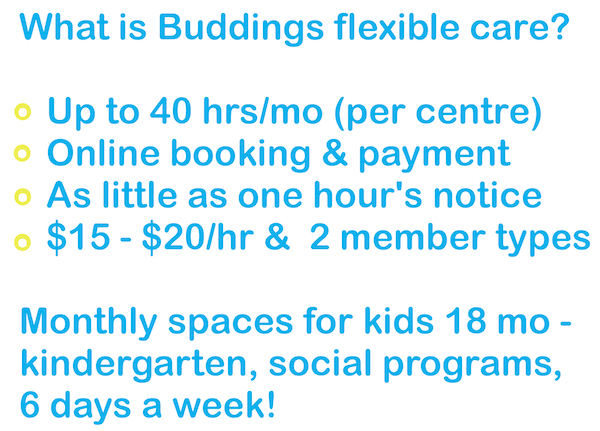 Two super convenient locations, Buddings also has amazing staff, dynamic programs, and a “sustainable living focus” that includes special recycling programs, connection to nature, and everyday opportunities to learn about the world. We’re your potty training partner, we offer daily snacks and cooking, naps by request, and NO WAITLIST! 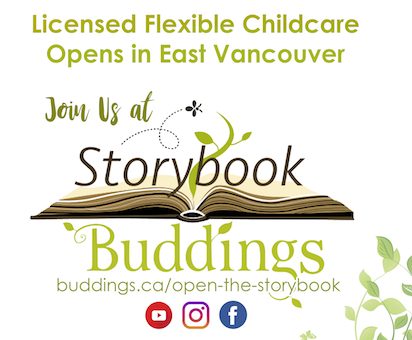 So is Storybook Buddings a fantasy daycare? Join us on June 1, at 1438 Cedar Cottage Mews, from 2 – 5pm, to see for yourself!